Corriepaca from Amy at Spunky Eclectic in the Mahogany colorway, bought after my dye day at her shop in August, along with a new drop spindle, which I used for the singles. I am possibly the world's slowest spindler, mostly because I forget how easy it is to pick up during a few free minutes and add on a few yards. The singles took me four months (off and on), the plying took one evening (last night). 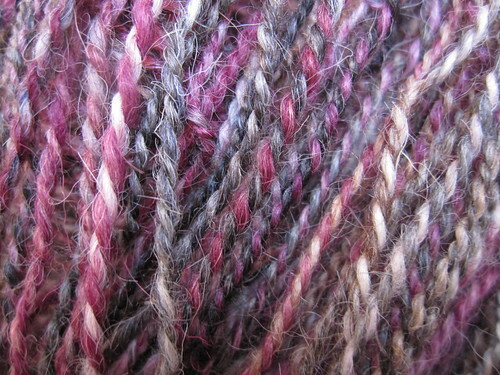 The top was a beautiful combination of dark maroonish-pink, brown, black, grey and white. 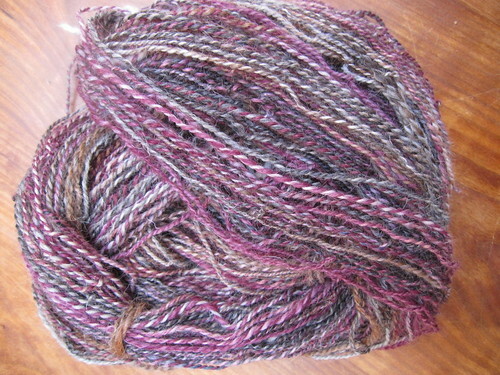 Singles were plied at 12:1 on my wheel, and the final yarn was soaked overnight in warm water and Soak. Spun out in the washer, thwacked and hung to dry. I'll update with final wpi/yardage measurements when it finishes drying, which hopefully will be soon. 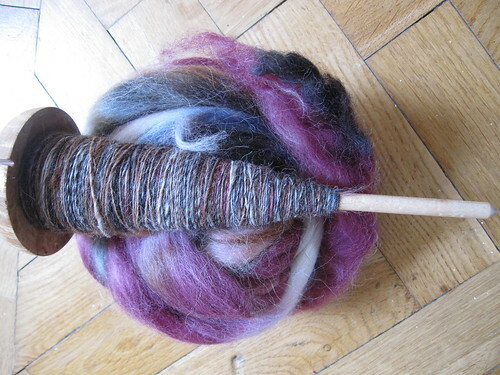 Per usual, Amy's fiber is lovely to spin and beautifully dyed. I've got a pile more waiting, and I'm contemplating what to throw on the wheel (or spindle) next! I'm also trying to come up with a list of fibery goals for 2011 - there's a thread in the LSG group about 11 projects for 2011, which I like the idea of, but per usual, all the things I'm coming up with are Big Projects. We'll see if I can get it down to something reasonable. I also really like the Yarn Harlot's self-imposed sock club - picking out 12 sock yarns and 12 patterns, and pulling one off the shelf each month. My record with the Knit Love Sock Club didn't work out so well this year, so I've got a pile of sock yarns sitting around to be used up. As well as a bunch of new patterns to work up. So that's another possibility. I'll see if I can't get things worked up for a New Year's day post. I know that 2010 was a tough one for many people, so I'll end 2010 by wishing all of you a happy, healthy, joy-full 2011! Written by porpoise On December 31, 2010 In "progress reports", "spinning"